This is like a bomb news for Scientists, for the first time on the history of human kind , the human eyes can now see the X-Ray . 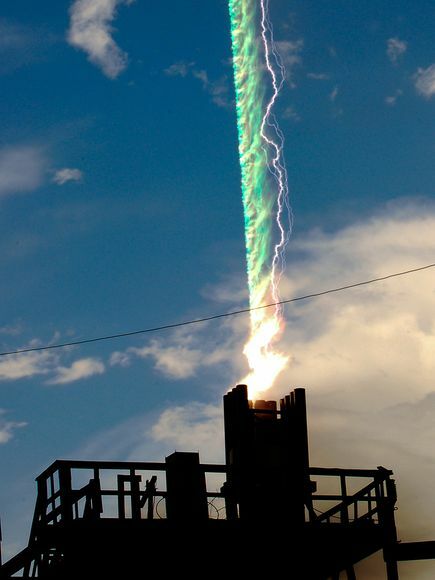 Thanx to a camera that able to works at one-sixth the speed of light and captured a lightning strike X-Ray radiation with the help of a rockets and wires During a recent thunderstorms in Camp Blanding, Florida. "Something moving this fast would go from the Earth to the moon in less than ten seconds," said Joseph Dwyer National Geographic News quoted , a lightning researcher at the Florida Institute of Technology in Melbourne. The camera cost 1,500-pound (680-kilogram) , with the size and shape of a refrigerator and capable of taking ten million images per second ,really fast ! the X-rays enter the box through a small hole that in turn focuses them, like an old-fashioned pinhole camera. "Almost all the x-rays are from the tip," Dwyer said. "We see the x-ray source descending with the lightning at up to one-sixth the speed of light."